Stone walls and a designer garden – Johntheplantman's stories, musings, and gardening. My job as a landscape designer allows me to see unique situations and to meet some rather interesting people. 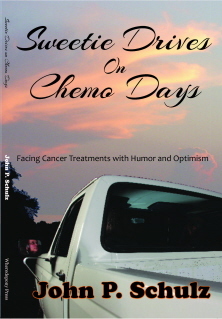 Last Friday evening, Dekie and I drove way out on a one and a half lane road through the foothills to meet Tom Adams. Tom is an excellent gardener, a philosopher, a lover of living things, and quite a delightful character. I had been told to drive across the county line and go a few more miles. I was to look for a nice garden on the right and the house would be across the street. The well marked two lane road lost the center line after a while and then got narrower and narrower. The scenery was wonderful. I took a hard left and then another hard right across the bridge and drove a while longer. I was almost late. My appointment was at 6. Around another curve I saw what must be my destination. I couldn’t get a picture of the entire layout, but I did get this one from the back of the corn plot showing the sprinkler head raised up on a post and the scarecrow. 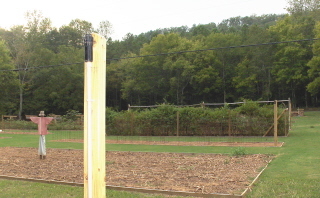 To the rear, you will see a blackberry patch in front of a trellis of beans. Tom said that he was going to take out the blackberries because, even though he got a good yield on the outside, reaching the inside fruit became a form of self punishment. He told me that the “teepee” frames for the beans were not effective and that next year he would build frames that were straight up. He said that he found the beans didn’t want to grow sideways. 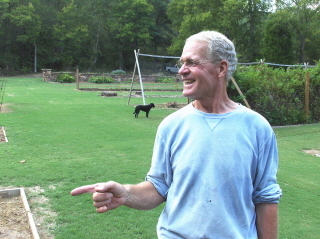 Tom told me that he uses the beds to experiment and that he has grown diverse crops such as zinnias and flax. Then he explained how flax is treated to make linen. Not that he made any linen, he’s just interested. After a very interesting conversation about the garden and the perennial flower border at the front wall, we began talking of stone. 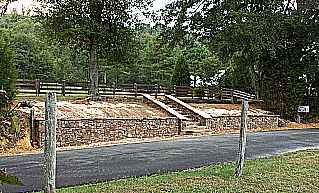 It seems that When Tom bought the property, he inherited mountains of stone—which suited him well. He likes to build with stone. I walked up from the driveway and found this pile. 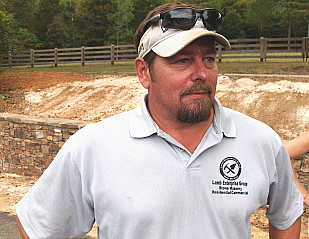 David Lamb the great stone mason. 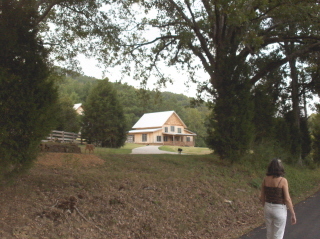 We got so involved in the gardens and stone work that I never got to see the house that Tom built from an old barn. I did sneak a picture of it in the fading light, though. We walked down by the bold creek to look at more stone. 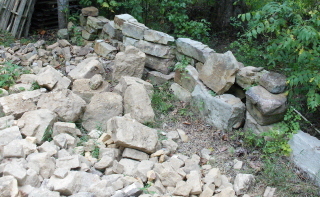 Tom said he had piled a lot of rocks in this area and it was ugly, so he turned some of it into a wall around the rest of the pile. Dekie took a bit of a rest and petted the well behaved English shepherd. 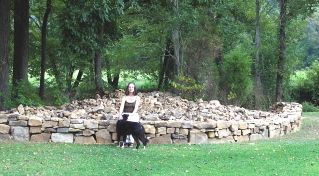 A rock wall in front of a pile of rocks. As we walked back toward the car, I remarked on an interesting mowing pattern in the pasture. Tom called it “lawnmower art”. He said that he used to cut the whole field but then he figured out that the center part was where the deer liked to have their babies. So he left it untouched. I don’t know for sure, but if I were a betting man, I’d bet that there is a lot more to see at the farm which has been named “Snail’s Pace 88”. We’ll visit Tom Adams again. I promise. 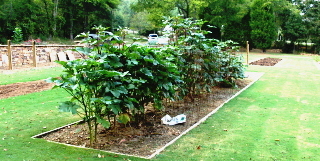 Will Goldin’s Eagle Scout landscaping project. People helping people. It was a wonderful adventure. Thanks for the tour, John. That was very interesting. Tom’s place is lovely!